Explore Christchurch's Parks & Gardens. Enjoy the unique landscapes of Christchurch by foot. Highlights include a mix of wildlife, historic sites and expansive coastlines. Duration of walk: The Blue Track is 11.4km in length and is fairly flat so should take around 1.5 - 2 hours. Start location: The main entrance and car park for Bottle Lake Forest is from Waitikiri Drive, off Burwood Road, via either Marshlands or Burwood. There is also access from Spencer Park and from North Shore along the Southern Pegasus Bay track. The Blue Track start is clearly marked and begins about 200 metres from the main car park. Bottle Lake is an exotic pine forest of approximately 800 hectares. Duration of walk: Various walks ranging from 5 - 40 minutes with the opportunity to combine walks. Halswell Quarry played a major role in the development of Christchurch. It ceased production in 1990 after 140 years of quarrying. The park features six sister city gardens and a Canterbury botanical collection. A unique 60.4 hectare park, with an unusual combination of recreational walks and historic sites. Toilets located in the main car park area. Duration of walk: A number of walks in the reserve with Panako Walkway being popular. It is a 40 minute walk within the reserve. Start location: Start from the Hussey Road car-park. The reserve extends along the Styx River for nearly 1.6km which provides a lovely setting for walks and recreation. There are 10 species of freshwater fish, approximately 46 bird species to be seen and an important spawning ground. A viewing platform makes a good place for fish and bird spotting. 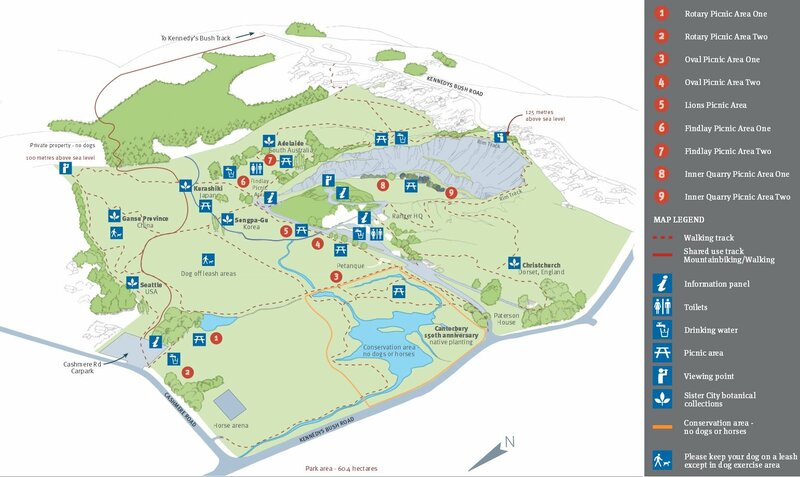 Duration of walk: There are a number of tracks linking North & South Hagley Park with the Botanic Gardens at the heart. A full loop is roughly 7km and will take roughly 2 hours. Start location: There is a car park off Armagh Street which is a good location for starting the walk. Walk alongside the peaceful Avon. Enjoy spring flowers in the Woodland area or the autumnal leaves around the park. Take time to view the Peace Bell, Central Rose Garden and Conservatories before taking the Armagh Footbridge back to the car park. Duration of walk: Spencer Park is a great spot for picnics and family outings. There is a short walk of 1k the loops a small pond with many birds. Start location: Start at the main car park for Spencer Park which is off Lower Styx Road. There has been considerable native planting attracting many birds to the area. There are sheltered picnic areas that can be booked.